I love gaming, and I love Cross stitch, so obviously this was the natural progression. 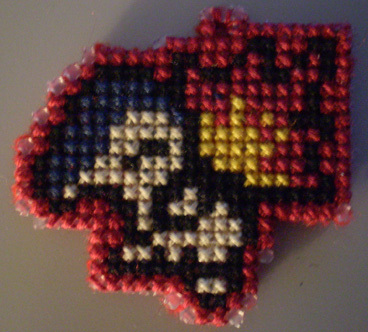 I made this pattern from sprite image myself, but there are sites you can get patterns from, like http://www.spritestitch.com/ which is an awesome site. Alternatively, you could do what i did. Open a sprite in paint, increase the image size by 500% and use blue to draw a grid onto the image, print, and stitch. I wanted to turn this into a keyring, so I used Plastic canvas, and after I did the design, backed it with felt, and went around the edge in a matching colour. I had a problem with the corners showing, but all in all it looks ok.